Swimming Pool Designs – Nothing is more relaxing than lounging by a stunning pool and going for a swim. Many of us have to travel for that luxury but a lucky few have a backyard getaway featuring the latest swimming pool designs to “staycation” in. We’ve rounded up 21 of the most sublime swimming pool designs for you to enjoy. Some might argue that the indoor location of the pool is a disadvantage but it depends on what you’re looking for. The pool seems to have the right size for recreative swimming, but not training sessions. It has an attached round spa for when you are done with your workout. The pool mostly belongs in spa clubs or luxurious houses. There is a second option though if you must have an indoor pool. You could build an insulated cover structure over an in-ground pool. 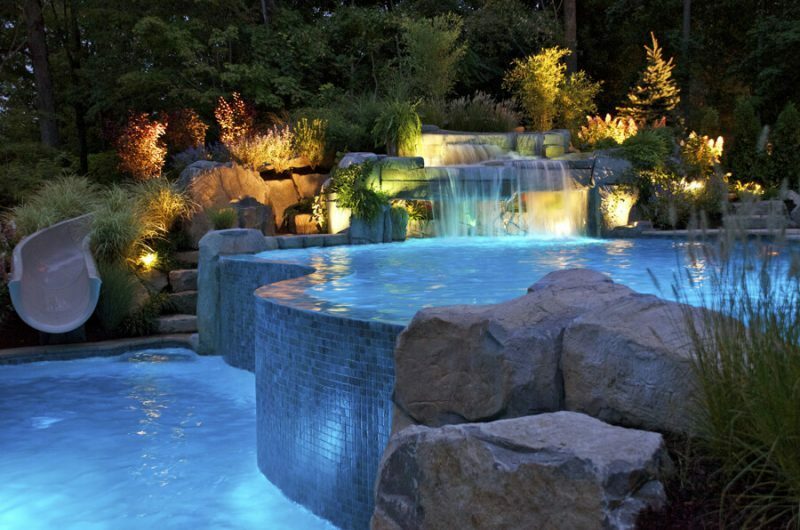 This a small swimming pool design with a vanishing edge and a small waterfall. This time, they didn’t try to make it look as natural as possible. The surrounding view takes care of that while the pool itself provides some contrast. Its modern look combines with the natural environment suggesting two worlds that collide. The pool is shaped as a circular based arch. You can see that two types of tiles were used: dark blue for the outer edge and lightly colored ones for the bottom. As for the cascade, the water comes directly from a cement structure through a wide nozzle. Notice how the stream is continuous to match the smooth surface of the water. The designers tried to recreate a real river bed with multiple levels. A wall with tiny tiles separates the upper from the lower part of the pool. One can swim in the upper level because the lower one is too small for that. The waterfall theme is present in this design as you can see the water pouring down natural rock walls. The flowers soften the rough edges of the stone walls and so does the curved shape of the edge that separates the two levels. The two big rocks from the right corner of the image reinforce the mountain stream natural look. In order to pull off something like this, you need a significantly big property with surrounding vegetation. 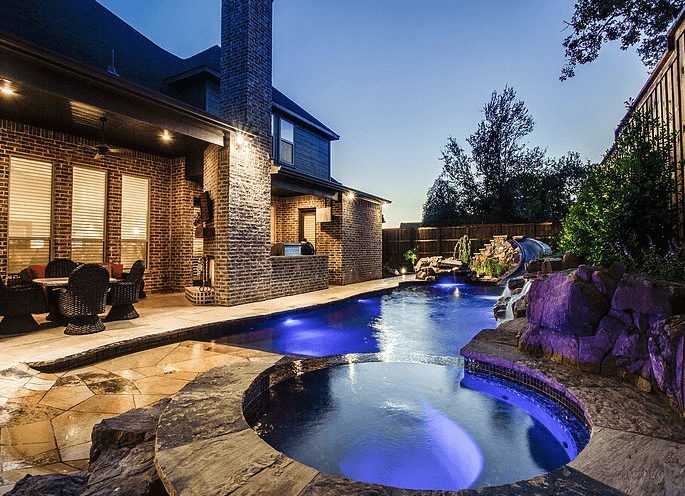 It’s only fair to open this list with a pool that exceeds all price ranges and expectations. 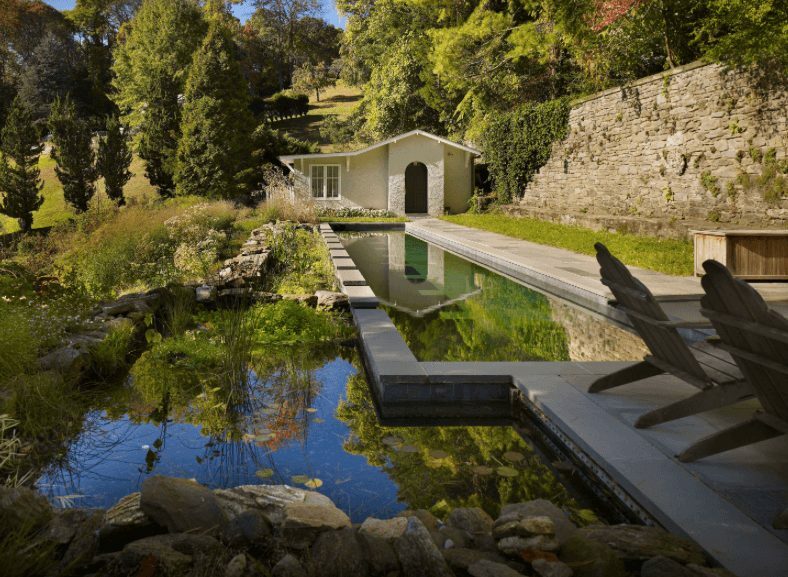 This violin-shaped pool belongs to Jay Dweck, a man for whom money is not an issue, considering he was the head of equity strategies at Goldman Sachs. 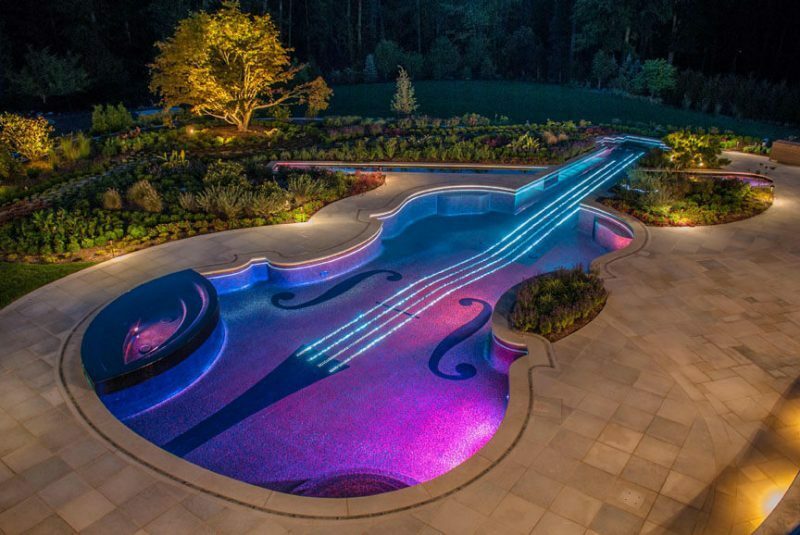 This pool costs $1.5 million and it was inspired by a Stradivarius that Jay Dweck once owned. The pool measures 1,300 sq. ft. and the effects were created with 5,600 fiber optic cables that light up the strings. The pool interior is finished with $500k iridescent glass tiles. The lighting creates a beautiful artistic effect that makes the pool be more than just a violin shape of concrete in the ground. 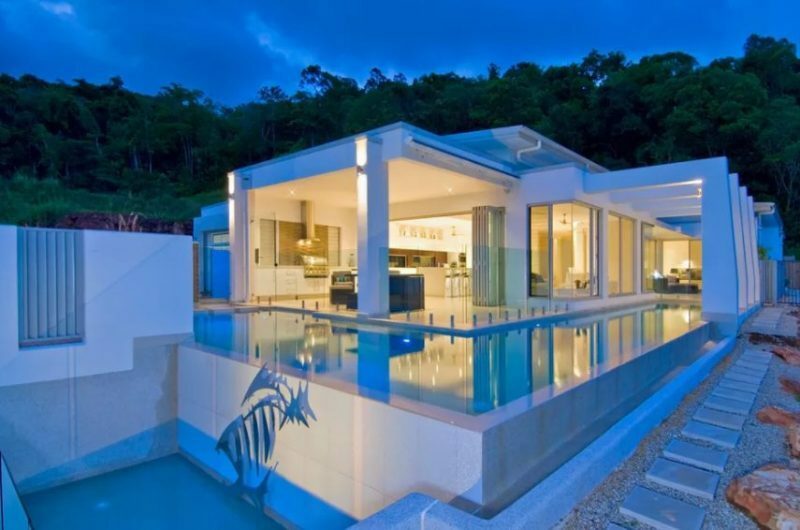 Designed by the same firm who built the million dollar pool above, this one costs between $300k and $500k. It is built on 2 levels and it has a waterfall that mixes well with the surrounding landscape meant to recreate natural settings. The purpose was to make a visual statement and to give you the feeling that you are swimming in the middle of the nature. Multi level swimming pools are significantly more expensive than regular ones and they usually require more space. However, there is a way to go around this. Instead of building a cascade like pool as in the picture above, you could build levels starting from the bottom of the pool. The disadvantage is that you will have different depths but it’s a cheaper option. Besides, it’s useful if you have small children who could play in the shallow area. The pool is shaped like a T and it’s surrounded by a deck. The rectangle that’s closest to the viewer is most likely an integrated spa area. The water curtain you see at the far left side of the picture is the main innovation of the design. If you take a close look, you will notice the projection of a video. This water screen is used for multimedia shows and laser projection to create a remarkable visual effect. The pool is long enough to do laps and it also has features meant for pure aesthetic reasons. The fire pit for example, is obviously not meant to warm the area. 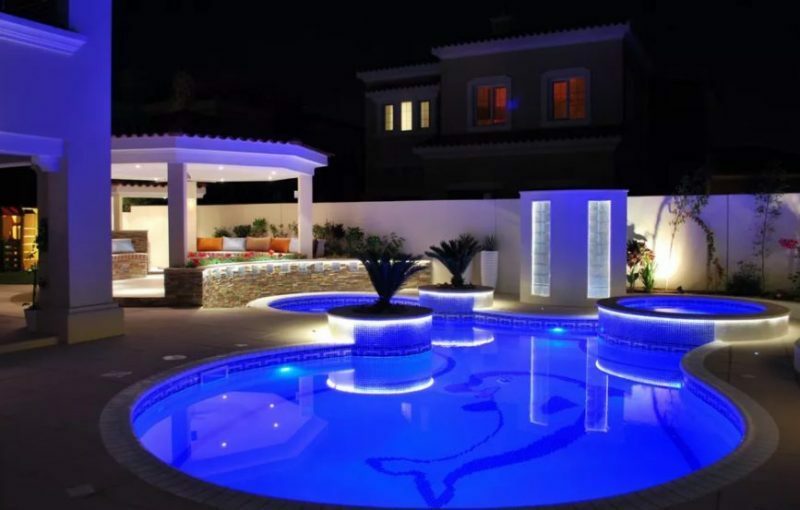 Building a fire pit near a pool is a trend seen mainly in luxury mansions but it begins to spread to regular homes too. It has an addition where a small jet goes straight up in the air. The pool is surrounded by concrete walls with tiles on the left side that provide the necessary frame for the fire pit and water fountain. Moreover, they prevent water from putting out the fire and reaching the steps. This pool is suitable for long and narrow yards. You don’t need a luxury house to build this design. People who train at home will find it to be a valuable investment. The pool is wide enough for 2 people to swim side by side at the same time. It’s surrounded by vegetation and a small pond to make the pool blend with the trees and hills around the house. The swimming pool is made of gunite. A typical project built by this company starts at $60k but clients usually end up spending $100k-$150k. 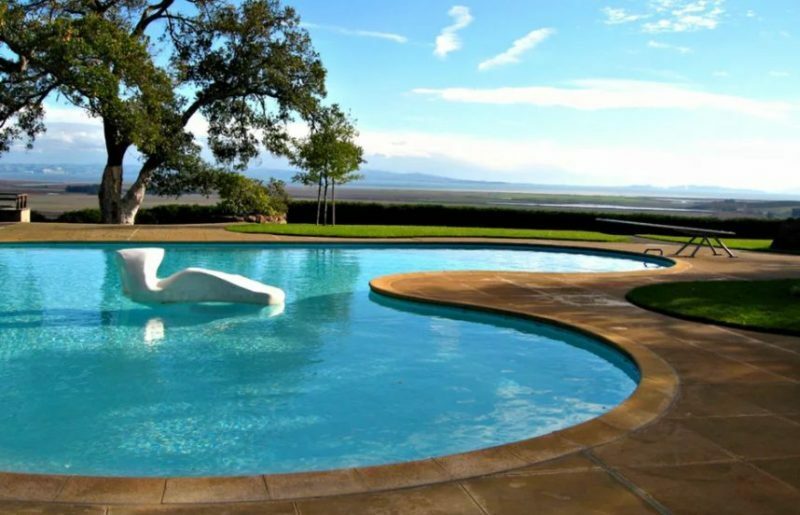 Pools with vanishing edges are very popular these days especially if they’re built in areas with breathtaking views. This one is a medium sized edge pool with a rectangular shape. There are no special lighting effects but nobody prevents you from installing some light fixtures. The pool has access steps in the left corner to make a smooth transition to deeper water. Also known as infinity pools, these models cost about 20% more than regular ones. You might need a separate collector tank if the catch basin isn’t big enough to support the bather load and make-up water. 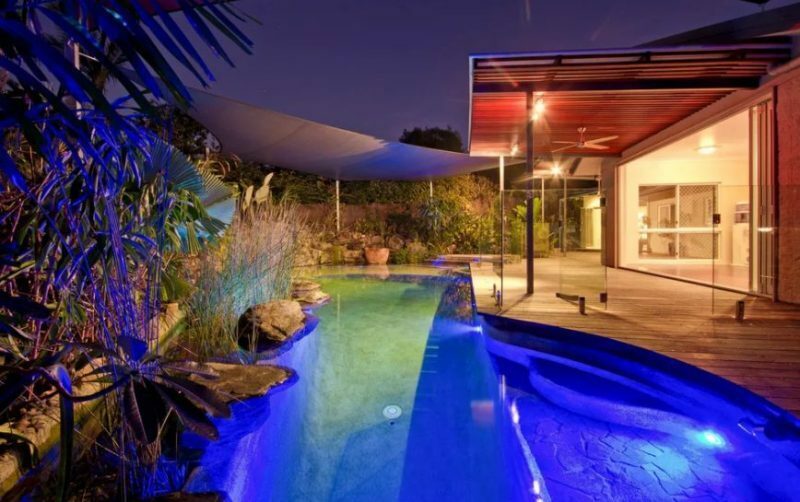 This pool has an interesting shape that combines straight and curved lines. It looks like there are 3 seats submerged in the water so that you can relax comfortably with a drink in your hand. The tiles are high quality and pricy. The 2 fire pits on the edge of the pool make the design more interesting and modern. The lights that make the water look blue contribute to this effect and instantly catch the eye of a buyer who visits the house after dark. Expensive models come with a control system that owners can use from inside their home or via a mobile device. You can control that purification system, the lighting and the fire features among other things. This model reminds of equatorial wilderness, much like a lake in the middle of a thick forest. The pool has a freeform design surrounded by natural stones with waterfalls. The stones “bleed” water that gently falls down into the pool. Access is eased via the underwater steps. It’s obvious that the pool cannot be used for lap swimming, but yet again it was not built with this purpose in mind. The main idea was to create a luxurious natural landscape centered around a high end swimming pool. This is a small rectangular pool with an attached round spa. The purple lights significantly improve the appearance of the design. 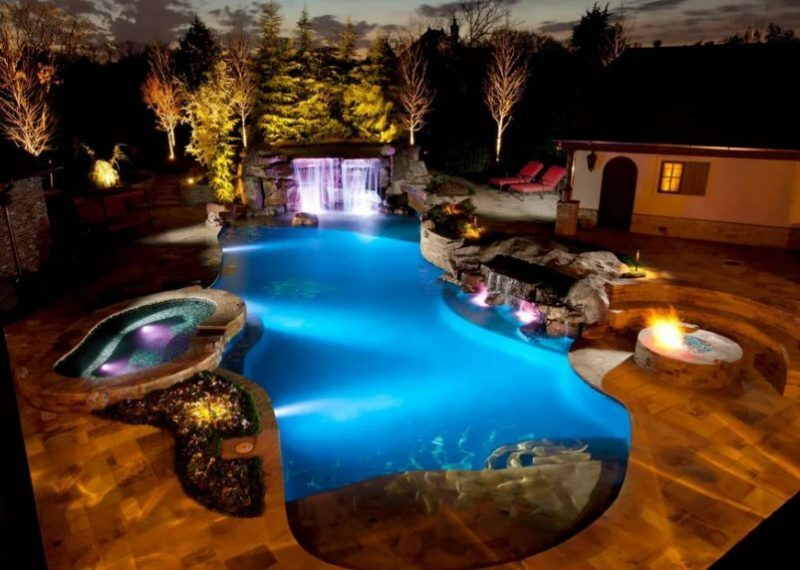 Anyone who sees the pool at night with the lights on will wish to have one that looks the same. The lighting somehow reminds you of a laguna. The yard is not very large, so this pool would fit in any averagely sized yard. The fence is masked by stones and vegetation in an attempt to recreate a natural environment. You can even see a couple of water streams going down into the pool. 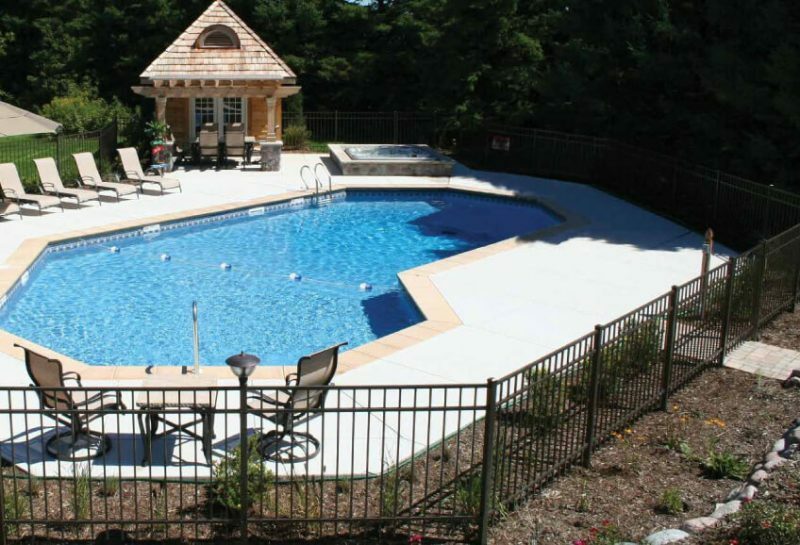 This pool is roughly shaped like an L and “embraces” a part of the house. You can see the spa enclosed by walls on the left side of the picture. It’s evident that the pool is meant for lazy afternoons when you want to enjoy the sun floating on water. One issue might be the proximity of the doors to the pool itself because splashed water could smudge the glass and might even get inside if the doors are open. Apart from this, the pool is just the right size: small enough to fit a regular yard and big enough to play around a bit. This design is dominated by straight lines without forming a regular form. The water is below ground level to minimize the amount that reaches the patio. There is a ladder with handrails that facilitates access. This is not a luxury model and it can be easily built in an ordinary backyard. You could also build the small spa beside the pool as you can see in this image. Here’s a small freeform pool with steps. At the top level, you can see a smaller one that basically acts like a reservoir for the small waterfall that goes into the large pool. If you don’t like the waterfall, you can skip it and use the space to add some patio furniture instead. Not only that it’s a cheaper option, but it’s also done faster so that you can enjoy the pool until the summer ends. Modern swimming pool design does not always mean that a pool was built recently or has all of the most high-tech features and materials. Modern pool design dates back to California in the 1930s, when wealthy movie stars were able to afford houses with landscaping that blended the indoor/outdoor lifestyle. These early residential pools often reflected the home’s architecture, complementing its design rather than competing or looking like a stand-alone feature. A striking example of continuing architectural design into a yard and pool, this home features a lap pool that spills into an adjacent lower-lying catch gutter, where water runs into a balance tank at the opposite end of the pool. From the vantage point of the lap pool, the balance tank appears to be a separate water feature or adjacent pool. An abstract fish mural on the support wall ties together the two bodies of water. Many contemporary homes are on small lots, which presents a challenge when designing a pool and outdoor living space. A pool, spa, and bar were all incorporated in a limited area, with lighting that accentuates the round forms of the all three components. The pool uses an ionization disinfection system to sanitize the water. 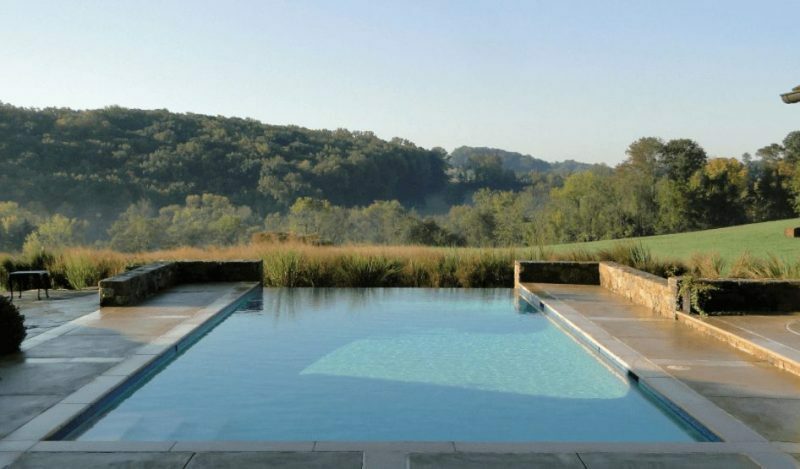 Not all modern pools are geometric, as evidenced by this elegant, curving design set amidst the landscape. Existing patios at varying elevations made this pool project a challenge: the decking was able to tie into the elevations without creating noticeable steep slopes. A large gutter was built underneath the deck cantilever to contain and conceal the surge tank. Also designed on a small lot, this space was designed to accommodate the client’s request for a large swimming pool. Adding to the challenge: the house and pool house were already in place when the pool project began. The client also requested waterfalls that be positioned away from the house to escape the sound. 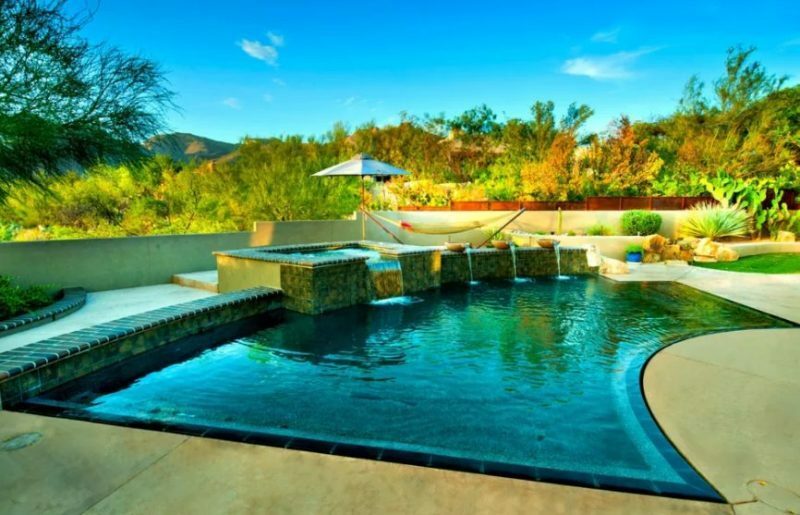 The builder created a long, freeform pool with two waterfalls and a hot tub situated between the main house and pool house, tying together everyting. The clients for this modern design wanted a home and yard with a strong focus on sustainability and innovation. Nature is mimicked with a mixture of aquatic plants, reeds, and lotus. 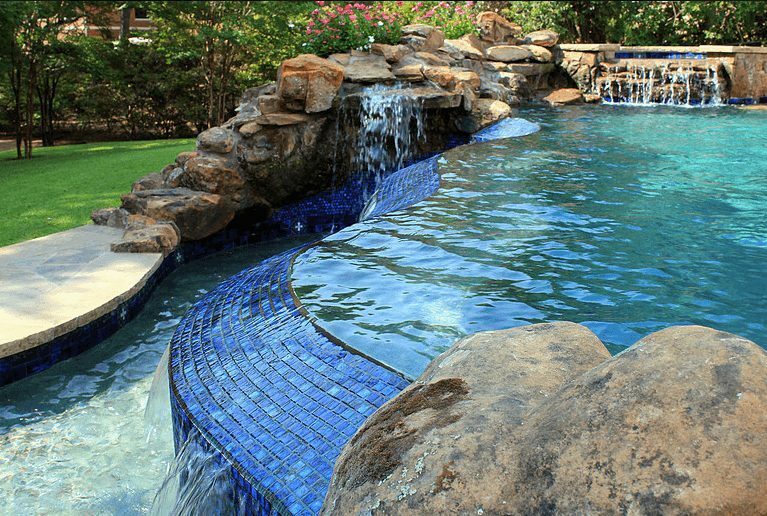 A waterfall splashes through a large natural boulder, while local river rock and different shades of PebbleCrete were used for the pool surfaces. Continuing with the natural theme, the pool’s entry steps were made from hand-cut stone, then accented with blue LED lights. 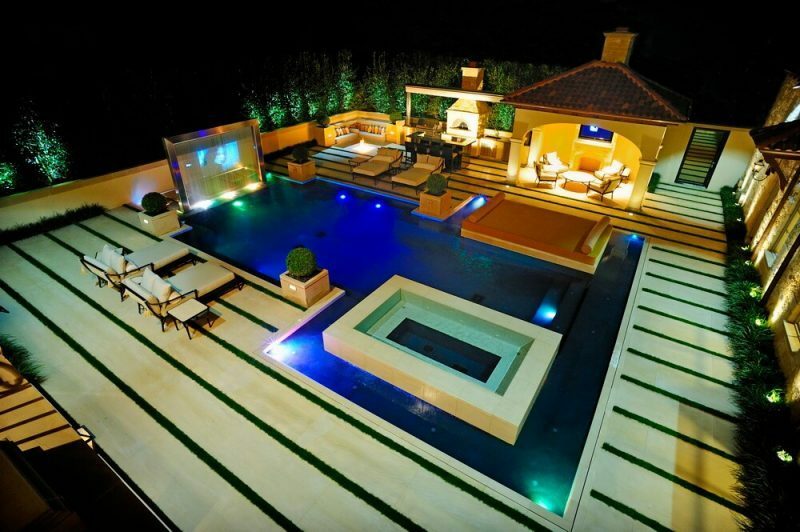 That’s 21 very beautiful swimming pool design. How do you think of all the above pool designs? Hope you find a lot of inspiration here.